Safely observe the sun in amazing deatil with this high qualilty scope equipped with glass or Mylar white light solar filters. 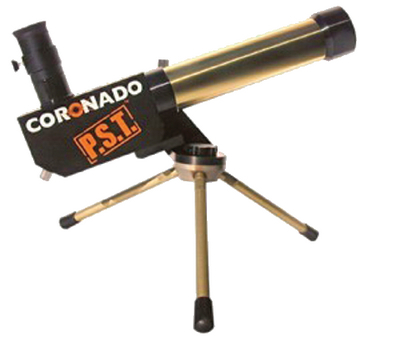 The scope includes an integrated hydrogen alpha solar filter that enables you to see sun spots, solar phenomena, flares, filaments, and prominences. Additional features include a 20mm Kellner eyepiece, Coronado Sol Ranger Sun Finder, 1/4", 20 thread tripod adapter socket built into the base. Milled aluminum construction offers durability. Includes five-year warranty.